The December update of the PPF’s 7800 index of pension fund assets and liabilities revealed a sharp increase in funded position for schemes in aggregate over the course of 2013, from a funding level of 83% at the end of 2012, to 98% at the end of 2013. These levels compare to the low point of 78% in May 2012, and a high point of 130% in June 2007. The PPF has produced the data since January 2006. The last time the funding level was this high was in early 2011. However, this increase probably doesn’t mirror the increases that most schemes will see in their accounting or technical provisions numbers, which will likely be around half that (ie, an increase in funding level of 6-8%). This is due to the fact that the majority of PPF benefits have a much lower level of inflation cap than most schemes, meaning that the PPF measure of liabilities is linked more closely to the nominal interest rate than the real interest rate (this is detailed in the PPF Purple Book 2013, which tells us that the sensitivity of the aggregate liabilities to nominal interest rates is about 2.5 times that of the sensitivity to real rates). Over the course of 2013, long-dated nominal interest rates rose by around 0.5%, whereas the increase in long-dated real interest rates was much less. For the purposes of accounting disclosures, corporate bond spreads are also important and these declined in 2013, also offsetting some of the rise in gilt yields. In the PPF 7800 numbers for 2013 the increase in funding is made up from an 8% decline in liabilities (consistent with an increase of long dated nominal rates of around 0.5% and an average duration of 16 years) and a 6% increase in assets, which is very much consistent with the 35% aggregate allocation to equities described in the 2013 Purple Book. As many readers will no doubt be aware, the method of valuation of PPF liabilities (the section 179 valuation) places a lower value on the liabilities than a scheme’s Technical provisions, or accounting basis. For example at the end of September 2013, Mercer’s estimate of the aggregate accounting basis funding level of UK schemes stood at 88%, compared to the PPF 7800 figure of 93%. Overall I would expect that the c6% increase in asset values reported in the PPF 7800 index would be consistent with the aggregate experience of UK pension funds in 2013, but on the liability side when viewed through a scheme technical provisions lens the fall in liabilities would be much less than for the PPF 7800 index, in fact the liabilities could well be broadly unchanged or see a small increase depending on the exact characteristics. 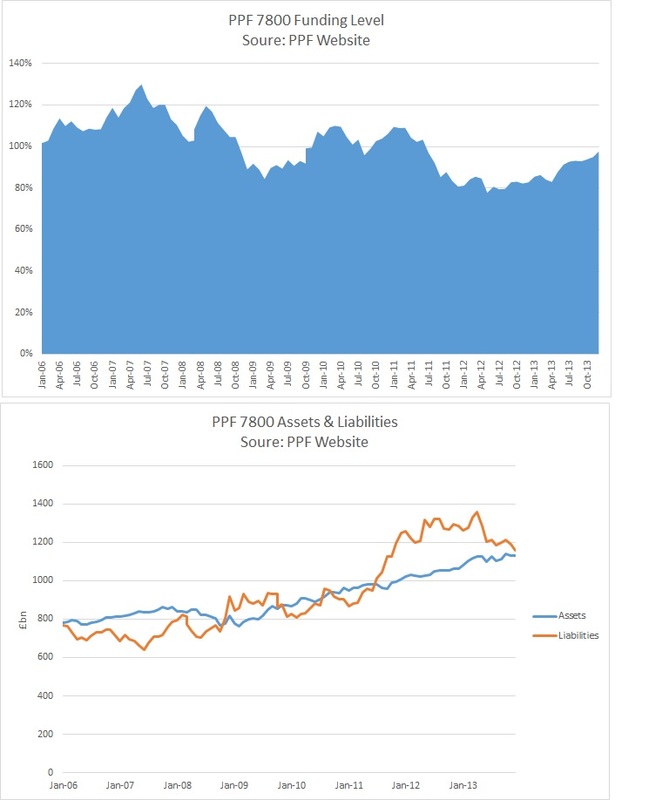 The volatility in the PPF 7800 funding level numbers continues to be driven by the liabilities as opposed to the assets. Over the period since January 2006, the annualized volatility of the assets was c6%, whereas the volatility of the liabilities was more than double this, at 14%, and this was also the case during 2013. What is the purpose of a pension scheme?